Hundreds of thousands of Internally Displaced Persons (IDPs) from Mosul, Iraq, are bracing themselves for the sizzling sun and the sweltering temperatures that come with summer. 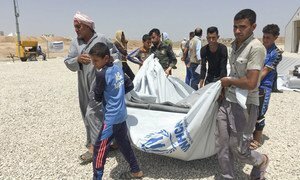 The United Nations migration agency today warned that while hundreds of thousands of people displaced from Mosul have braved the ongoing offensive to oust the Islamic State in Iraq and the Levant (ISIL/Da’esh), the beleaguered citizens are now struggling to cope with another danger – the sweltering summer heat. “With temperatures nearing 37 degrees Celsius and rising, the coming months will be trying,” said UN Migration Agency (IOM) communications officer Hala Jaber. From June onwards, temperatures in the Ninewa governorate will hit, and sometimes surpass, the 50° mark. The PVC tents that provided warmth during the cold winter will be hard to tolerate in summer, as temperatures inside register at least 10° higher than outside. The scorching heat is already impacting health and living conditions at IOM’s emergency site at the former Qayara airstrip, which hosts over 52,000 displaced Iraqis or 8,746 families. Thirty-seven-year old Thaer, who returned to Qayara after his six-month-old son was treated for acute dehydration sleeps outside to escape the suffocating heat. At full capacity, IOM teams are in the process of ensuring that all internally displaced persons (IDPs) are equipped with basic materials to help alleviate summer discomfort, including supplementary mini kits – containing 40-litre capacity cool boxes, battery-rechargeable fans and summer bed linens – for distribution to some 7,790 families in Qayara and neighbouring Haj Ali camp. IOM’s primary health centres in both Qayara and Haj Ali, home to 34,000 people, each serve an average of 1,800 patients per week with medication. Displaced people with scabies have also been seeking treatment in IOM’s medical centre in Qayara, prompting the primary health care to set specific morning hours, exclusive to these cases. Winter colds have been replaced by diarrhoea and dehydration, particularly among children. With only 33 per cent of the required $28.83 million needed by IOM for the Mosul response, the funding gap is having a significant impact on IOM’s ability to effectively provide for the scale of needs created by the Mosul crisis. Less than four weeks after opening its last camp, the United Nations refugee agency welcomed families fleeing the fighting in western Mosul this week with its twelfth camp set up deal with the ongoing emergency in and around the Iraqi city.